Where are the Nerves ?? 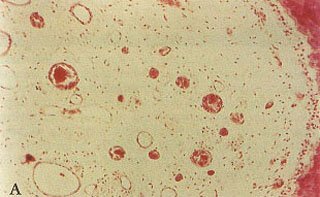 Abstract: The dental pulp tissue from three elephants was examined histologically with hematoxylin & eosin and s-100 protein stains. In all specimens normal pulp was found with the exception that no nerve fibers (myelinated or non-myelinated) were demonstrable in any of the numerous sections prepared. In normal mammalian dental pulp tissue, including that of humans, the main components are ground substance, fibers (fibroblasts), nerves and blood vessels. (1) Gray’s Anatomy textbook defines dental pulp as “a loose connective tissue richly supplied with blood vessels and nerves”. (2) The nerves and blood vessels are usually present in association with one another. 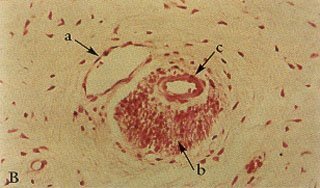 The typical histological preparation of mammalian dental pulp tissue presents an image of nerve fibers, venules and arterioles with a layer of odontoblasts on the periphery of the pulp (Figures # 1A & 1B). Both, the myelinated and non-myelinated nerves usually run adjacent to the arterioles and venules. So common is the image of nerve tissue presenting itself in association with the more easily visualized blood vessels, that it has become common place to simply identify the structure as the “neuro-vascular bundle”. The focus of this paper concerns the analysis of this “neuro-vascular bundle”(3) in the dental pulp tissue of the elephant. Fig. 1A – Normal, mammalian (primate) dental pulp tissue showing dentin, pre-dentin, odontoblastic layer, sub-odontoblastic plexus, fibers, blood vessels and nerves. Fig. 1B – Higher power view of figure #1A showing the association of venule, nerve fibers and arteriole producing a typical “neuro-vascular bundle”. During the past several years, the authors have had the opportunity to examine the dental pulp tissue from three elephants, two African adults – one male, one female, and one Asian male stillborn. The first specimen (elephant # 1) came from the left tusk of an 18 year old, 2140 kg, male, African elephant (Loxodonta africana) living in another collection and suffering from chronic, localized osteomyelitis of both front feet and carpal joints secondary to the fracture of a left carpal bone. The animal was euthanized with carfentanyl, xylazine and phenobarbital. 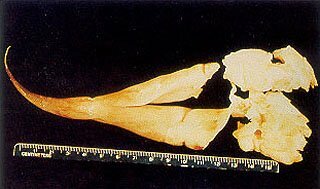 No pathologic findings other than the osteomyelitis were encountered during the necropsy which was begun immediately after death. The left tusk was removed in its entirety, including a section of surrounding maxillary bony structure, in order to collect a representative sample of the apical periodontal tissues. A wedge-shaped section was removed at the anatomical apex of the tusk, and several smaller sections were prepared for histologic analysis. The remaining pulpal tissue contents of the tusk was then removed in one piece, and seven representative areas were chosen for histology (Fig. 2, 3). Fig. 2 – The intact soft tissue contents from the dental pulp chamber of the left tusk of elephant # 1. Arrow indicates termination of odontoblastic layer (dentin/ivory wall) of the tooth. Tip of tusk is to the left of the arrow (curve is processing artifact), and that portion of pulp tissue located to the right of the arrow represents the bulbus Apical Center of Growth of the tusk with remnants of the epithelial sheath of Hertwig with rests of Malassez wrapping around it. 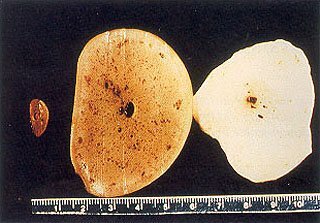 Three cross sections of the pulpal structure seen in Fig. 2. Note the intense vascularity of the tissue closer to the “pulp horn”. The second adult specimen (elephant # 2) came from the base of the right tusk of an African female (Loxodonta africana) living at the San Diego Wild Animal Park, also suffering from chronic, unresolvable osteomyelitis in both front feet and carpal joints. This animal was humanely euthanized with an intravenous overdose of euthanasia solution. No pathologic findings other than the osteomyelitis were encountered during necropsy which was also begun immediately after death (Fig. 4). Fig. 4 – Gelatinous, soft tissue mass removed from dental pulp chamber of the right tusk of elephant # 2. Notice damage to apical fragments. 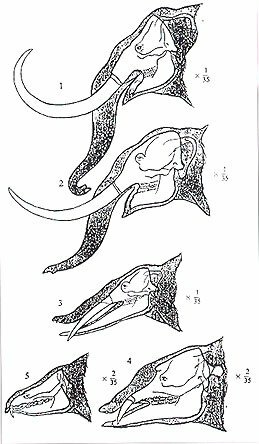 The third specimen (elephant # 3) came from the left dissected maxilla and mandible of a Asian male stillborn (Elephas indicus) on day 686 of gestation at the Wild Animal Park on 27 September 1991. Necropsy was performed immediately, and no clinical findings of significance were noted (Fig. 5, 6). Fig. 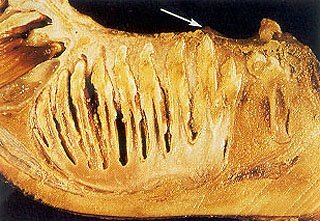 5 – View of sagittal section of the left mandible of neonatal elephant #3. Anterior is to the right. Notice the developing dental follicles of molar # 1 and molar # 2 within the body of the mandible. Fig. 6 – Close up view of mandibular left molar # 1 seen in Figure 5 with gelatinous dental pulp tissue enveloping the entire apical region of the developing tooth within its encapsulated dental follicle. Note (arrow) the soon to be erupting cusp tips on the occlusal surface of this incompletely mineralized molar beginning to push through the oral mucosa as they prepare to erupt into the mouth. All of the specimens were fixed in 10% formalin solution, sectioned at 7 F, and sections were then embedded in paraffin and stained with hematoxylin and eosin. The intact pulp tissue had the appearance and texture of firm gelatin, and either tapered toward the tip of the tusk, or surrounded the entire apical area of the developing molar dentition. Upon histologic examination, ground substance, fibers and blood vessels were observed in the adult specimens. Arterioles and venules coursed through the pulp, but no nerve fibers were seen in any of the sections. Further sections were therefore cut, and were stained with s-100 protein 4 to identify nerve elements(4) (Figure 7). Fig. 7A – Typical longitudinal section seen in Figure 11 stained with s-100 protein. Notice there are no nerve fibers stained. Compare with Fig. 9. Fig. 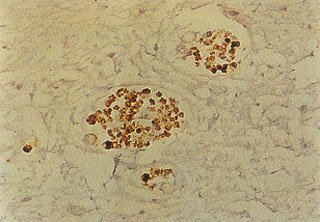 7B – Typical higher power H&E stain of venules and arterioles with no nerves present. Compare with view seen in Figure 1B. Fig. 7C – Typical low power H&E longitudinal section of same “normal” elephant pulp with “neuro-vascular bundles” seen in Figure 7B. All sections were negative for the presence of nerve fiber bundles, and no nerve fibers were demonstrated on s-100 protein stains (Fig. 7A). We fully expected the same “neuro-vascular bundle” pattern of nerve, arteriole and venule to be present in the tusk and molar dental pulp tissue of the elephant, as that seen in the teeth of man (Fig. 7) and all of the other mammals. However, in the sections examined no nerve fibers were identified despite a prolonged and repeated search. A number of authors have commented upon the issue of tusk-related “toothache” in elephants. Typical is the comment made by H.F. Humphreys in 1926 to the effect that “It seems certain that the constant pain from the exposed pulp consequent on the fracture was the cause that had converted the animal into a rogue; a curious instance of toothache in an animal being fatal to several human lives.” (5) A number of other investigators (6-9) have described nerves in specimens of tusks, however, analysis of their data suggests that dental pulp tissue was not examined in sufficient detail, nor with a nerve-specific immunohistochemical stain. Rather, the presence of “nerve tissue” was assumed to be in association with the more readily identifiable “neuro-vascular bundle”. Fig. 8 – Close up view of the maxillary left molar # 1 opposing the mandible seen in Fig. 5. Notice the gelatinous nature of the contents of the developing dental follicle. These earlier claims all appear to be based upon second hand information, inadequate or empirical observation, less sensitive histopathological technic, and/or assumption. It is the authors’ opinion that these earlier claims for the presence of “nerve tissue within the dental pulp of the elephant’s tusk” must be discredited because of insufficient evidence to support the claim. Our examination of numerous dental pulp tissue sections from both tusk and molar locations was specifically structured to eliminate the possibility that we would miss any nerve tissue if it was present. It is probable that nerve fibers abound within the alveolar bone at the junction of the apex of the tooth with the surrounding connective tissue supporting the periodontal membrane. However we did not examine any tissue outside of the dental pulp. There is also a plethora of empirical data, references in the literature, and personal correspondence with the authors, which address this issue of fractured tusks without evidence of pain. 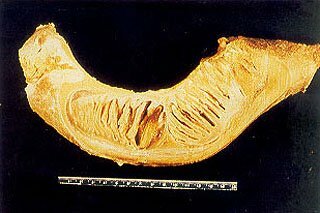 The authors have seen numerous examples in which a tusk had been broken, and bacterial infection of the pulp became a consequence. In some cases, the pulp cavity of the tusk was repeatedly washed out with various solutions, including antibiotics and disinfectants without the necessity of anesthesia. In other cases, no intervention occurred. However, in all of these cases, the clinical presentation was that none of the elephants demonstrated any evidence of pain. In the most severe cases of infection of a fractured tusk with obvious involvement of the surrounding periodontium and alveolar bone, there is often evidence of discomfort; but this is certain only in those cases with some evidence of infection extending beyond the limits of the dental pulp chamber. 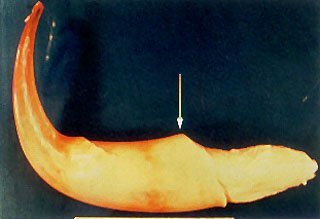 Thus, clinical evidence of pain with a fractured tusk does not materialize until the infective process reaches beyond the base of the anatomical apex of the tusk. Fig. 9 – A high power view similar to Figure #2, utilizing the nerve specific s-100 protein stain to demonstrate the customary association of nerve fibers to a typical “neuro-vascular bundle”. Compare with Fig. 7A. Fig. 10 – The evolutionary changes of Proboscidea. 1. Elephas columbi (early and middle Pleistocene); 2. Mastodon americanus (late Pliocene); 3. Trilophodon angustidens (middle and late Miocene); 4. Palaeomastodon (early Oligocene); 5. Moeritherium (late Eocene) (After R.S. Lull, Ann. Rept. Smithsonian Inst., 1909 – with permission). It is possible that nerve tissue may originate within the developing dental follicle and then degenerate with age in the elephant after the tooth is formed. Scattered evidence of the remnants of nerve tissue may remain only in the areas of the apex of the tusk involved with continuously erupting growth, as is the case of the epithelial rests of Malassez in the periodontal ligament. However, the results of our initial analysis of this specific “apical” area in the first specimen, was that “there was no tissue of specific dental pulp origin in any of the specimens examined” (personal communications with author). These initial samples were subsequently lost during shipment. We remain perplexed by the question: Where is the nerve tissue ? The question of “Why are there no demonstrable nerves within the elephant’s dental pulp?” is perhaps more perplexing than the fact that they are not to be found in the first place. Conceivably, there could be an evolutionary factor associated with the changes to the elephants face over time (Fig. 10). Or, perhaps the absence of innervation to the molars and tusk could have occurred as a result of natural selection for those individuals who simply did not suffer dental pain related behavioral inhibitions associated with the fracture of one of their teeth. Perhaps it has something to do with the succedaneous nature of the six sets of molars. The fact that a tusk extends so far out of the animals body may be a factor. 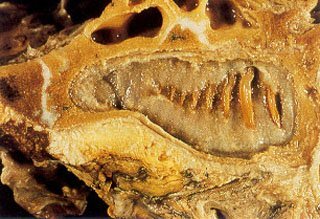 No other “sensitive” appendage is so “external” and “exposed”, or subject to such extremes of heat and cold to the point of freezing, as may have been the case with the tusk of Mastodon americanus. Tusks are also routinely subjected to enormous forces during fighting, digging and/or the de-barking of trees. Perhaps if they did contain highly sensitive nerves there would be much less activity possible with the tusk. Clearly, more study is indicated. We appreciate the opportunity provided by The Wildlife Safari Park, in Winston, Oregon to attend the necropsy of their elephant. Dr. Jack Mortenson and Amanda Sallon of Wildlife Safari Park, and their entire necropsy team from Oregon State University, College of Veterinary Medicine led by Dr. Olaf Hedstrom were very supportive of our efforts. We also sincerely appreciate the support provided by Dr. James E. Oosterhuis and his staff at the San Diego Wild Animal Park, and Dr. Bruce Rideout and his staff in the Dept. of Clinical Pathology at the San Diego Zoo. Ten Cate, A.R. : Oral Histology: Development, Structure, and Function 2th ed. C.V. Mosby Co., Saint Louis, 1985. Warwick, C. and Williams, P.L. : Gray’s Anatomy (35th ed.) W.B. Saunders Co., Philadelphia, 1973. Rosai, J.: Ackerman’s Surgical Pathology, 8th ed. C.V. Mosby Co., Saint Louis, 1996. Miller, W.D. : Studies on the anatomy and pathology of the tusks of the elephant. Dental Cosmos XXXII:337-348; 421-429; 505-526; 673-679; XXXIII: 169-175; 421-440, 1890-91. Humphreys, H.F.: Particulars relating to the Broken Tusk of the Wild Indian Elephant. Brit. Dent. J. 47:1400-1407, 1926. Weatherford, H.L. : Some Observations on the Tusks of an Indian Elephant. The Innervation of the Pulp. Anat. Rec. 76(1, suppl. ): 81-93, 1940. Stannus, H.S. : Diseases of Elephant’s Tusks. Lancet 1:617, 1911. Morrison-Scott, T.C.S. : A revision of our knowledge of African Elephants’ teeth, with notes on “forest” and “pygmy” Elephants. Proc. Zool. Soc. London 117: 505-527, 1947. Salzert, W.: Elefanten, ihre Pathologie und den Tiergärtner interessierende physiologische Daten. Dissertation, Tierärztl. Hochschule, Hannover, 1972.